COMMUNITY NEWS & REVIEWS: OBITUARY - Once again, I have the sad duty to inform our parish of the sad passing of Eileen Becker. Having lived amongst us for almost thirty years, Eileen was not only a well known resident but one who took part in many local clubs and societies. Her skill with a needle - be it embroidery, patchwork or quilts was always much admired and appreciated along with her warm heart, her happy outlook and her ready wit.! Her unexpected death at The Conquest Hospital, Hastings, at aged 83 and following a short illness was a sad shock to all who knew her. This charming and lovely lady will be truly missed by her twin brother and her son David, and daughter Julie who both had to make the long trip from Australia for this sad farewell. This much loved and much respected member of our community will be sadly missed not only by her beloved family, but by all her many friends and colleagues. TWO x V.-I.-D. -- No this isn’t a new gadget code - it just means ‘Two Very Important Dates’ to remember and the first one is of course “MOTHER’S DAY” which this year will take place on Sunday March 31st. Sadly, I shall not be able to share this with either my own lovely Mum or that of my Mum-in-Law as both are no longer with me and both are still greatly missed, so to all the Mothers’ within our community I hope each and every one of you will have a loving and beautiful day to remember. I hope you’ll all be spoilt rotten as I’m sure you all deserve to be. Enjoy your ‘Special Day’. The other V.I.D. is that on the same date - our English ‘SUMMER TIME’ begins ! So don’t forget to put ALL your time pieces FORWARD ONE HOUR - THIS SATURDAY night March 31st ( or 1.00am Sunday to be precise ! ) Hopefully it won’t be too long before the warm sunny weather catches up with the calendar and we can then all begin to enjoy and appreciate, the new seasons! WINE TASTERS: Back to the normal day of being the last Friday of the month, the members of this lively, and very friendly social group will be meeting on Friday March 29th at the normal time of 7.30pm.- THAT’s TONIGHT ! This is a super little social group of like-minded people who enjoy spending a couple of hours per month, - tasting and commenting on a selection of superb wines - plus tasty bread and a few nibbles - all wrapped up in good company, in a cosy venue - that being the Herdman Pavilion, in Ewhurst Green, (TN32 5TB) So if you would like to discover more of the wonderful world of wine, please come along and join in. No membership is required, just a courtesy call to Jan(Secretary) to ensure there will be sufficient wine & nibbles for all to enjoy, A charge of £5:00 per person is required, upon arrival to cover the cost of providing some great choices of quality wines from all around the world. If you think this may be something that would be of interest to you, then please contact Janis via her email which is: janhooper3@hotmail.co.uk to learn more of wine and this’great gang of ‘wine tasters’. STAPLECROSS BONFIRE SOCIETY: ‘BEETLE DRIVE’ - This age old pastime is proving as popular as it ever was with people of all ages realising just how much fun and enjoyable this game is. Everyone is invited to come along and have fun, Pit your skills against family, friends and neighbours whilst trying not to be beaten by your children !. Come along on Saturday night March 30th - THAT’s TOMORROW - to the Village Hall, Northiam Road, Staplecross, TN32 5QG beginning at 6.00pm. It promises to be a great fun night out ! LENT STUDIES: A last gentle REMINDER that this year,during the Lent period, there will be special opportunities for us to reflect a little more on what it is to be called to live the Christian life. The last of our two LENT STUDY mornings will be at St. James the Great, Ewhurst at 10.30am on Saturday March 30th.-THAT’s TOMORROW - and at the short weekly bible reflection at Evening Prayer - 6.00pm each Thursday, at St. Giles church, Bodiam. All are most welcome, of course, to attend events at either church. STAPLECROSS SOCIAL CLUB: Another GENTLE REMINDER that TOMORROW - this great little social club will be holding another of their popular events and that will be in the form of a “Race Night”. 7.30pm for starting at 8.0pm. As is usual at events here in this super little social club, right in the heart of our village, there will be a yummy buffet to accompany this evening’s entertainment. This promises to be another fun night, so please come along and join in. ROTHER RAMBLERS: Again two more walks are organised for our inclusion, and the 1st Walk is planned for Sunday March 31st. This will be an 8 mile circular tour all around Guestling. The meeting point is to be at Guestling Church. OS.EXP 124. TQ854144. (satnav TN35 4HS) at the normal time of 10.00am. Again a picnic lunch is suggested. Your ‘walk leader for this wander will be Martin and you may contact him on: 01424~752793 for all further information. 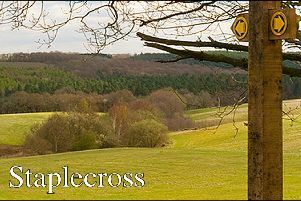 Walk No: 2 is to be a 9 mile circular meander of Southborough Common and Haysden Water. This outing is planned for Thursday April 4th and the meeting place will be on Southborough Common , near St. Peter’s Church OS.EXP135/147. TQ575428. (satnav TN4 0RU) again at 10.00am. The walk notes state that “You may park in the lay-by near the church, - opposite the cricket pitch. A picnic lunch is the order of the day. Rita & Lionel are to be your ‘walk leaders’ for this meander and you may contact them on: 01424~752452 for more details. EWHURST GREEN & STAPLECROSS WOMEN’S INSTITUTE: Our own local ‘band of merry women’ will be making their way to the Village Hall, Northiam Road, Staplecross TN32 5QG on Tuesday April 2nd to enjoy yet another fascinating and remarkable talk entitled “Medical Detection Dogs”. This amazing and very informative talk will be given by Pam & Doug Brown and will commence at 2.00pm. The monthly competition of ‘ A Dog Picture’ will accompany this talk and will be shortly followed by the undisputed “W.I. Afternoon Tea “. If you’d like more information on the W.I. - and this local village one in particular - please get in touch with our super secretary - Tricia on 01580~830128 who will be very happy to tell you what treats to look forward to during the rest of 2019 - and along with the remaining members, will also love to welcome you to any of our meetings. DATES FOR YOUR DIARIES: Two (2) gentle reminders of two more Very Important Dates in our Parish Calendar. DATE No: 1 is of the EWHURST PARISH COUNCIL --ANNUAL PARISH ASSEMBLE. This will take place this year on Tuesday April 9th in the Village Hall, Northiam Road, Staplecross TN32 5QG. at 7.15pm. Please come along early from 6.15pm - as this will give you chance to not only visit the display stalls set out on behalf of our some of our many local social clubs and groups, showing a glimpse of what is available, - but will also give you the opportunity to meet your local Parish Councillors, together with representatives from both Rother District Council, Mr Tony Ganly and East Sussex County Council, Mrs Angharad Davies. Arriving early will also allow you plenty of time to partake of the delicious and very much appreciated refreshment buffet available for all to enjoy. This evening is always well attended allowing plenty of time to ‘mingle’ before the meeting begins in earnest.at 7.15pm. Your questions and/or comments will be allowed and welcomed, at the appropriate interval within the Agenda. This Assembly is open to both the Public and Press alike and all will be most warmly welcomed. DATE No: 2 EWHURST, STAPLECROSS & BODIAM GARDEN SOCIETY -- SPRING SHOW. This marks the 1st in our Yearly Horticultural Shows for our marvellous little local Garden Society. Taking place on Thursday April 11th this will take place in the Village Hall, Northiam Road, Staplecross TN32 5QG at 7.45pm. Staging will be between 6.30pm and 7.15pm -only - after which the society will welcome our superb speaker for the evening Mrs Irene Eltringham-Willson who will delight - and shock us - with her talk for tonight entitled “Opening a Garden for the N.G.S.” Irene is a very knowledgeable and delightful speaker while the many varied spring flowers on display will fill your heart with joy at the sight and scent of them as they begin to fill the hall with their magic. Everyone is welcome to come along - with or without an entry to exhibit and for all further information, please contact either Sec. (Peter) on 01580~830316 or either of the Show Secretaries (Pam) on 01580~881839 or (Maggie) on 01580~830041) We all look forward to seeing you here. CHURCH SERVICES: Church services for the Parish of Ewhurst will commence at St James the Great, Ewhurst Green on Sunday March31st. ‘Mothering Sunday’ at 9.30am. This service will include Holy Communion. (CW) There will be NO SERVICES AT EITHER ST GILES CHURCH, BODIAM OR ST. MARK’s CHURCH, STAPLECROSS. In case you may be unaware, on Wednesday and Thursday morning - ‘MORNING PRAYER’ is now being held in St. James the Great, Ewhurst Green every week on these days at 8.30 am. ‘EVENING PRAYER’ is also being held every Thursday evening at 6.00pm. in St. Giles church, Bodiam. Do join us if you wish. - everyone is most welcome. If there is any church matter on which you feel you may need further assistance, especially Baptisms, Weddings and sadly, Funerals, then do please get in touch with the Priest - in - Charge - Canon Christopher Irvine on 01580~830925. Help in some way is always at hand and always so generously given, so do please contact him. PLEASE CONTACT ME: If you are arranging an event in the foreseeable future, --- whatever the nature of the event and however large or small, and you’d like some extra free coverage for it, - courtesy of the Observer Newspaper - then please get in touch. If it’s of interest to you, - it’s of interest to us. It’s never too early to send in any of the details and to tell us what you are planning. Many of you will be turning your thoughts to other events in the near future, indoors or out as Spring and new growth is given a helping hand as the clocks are now put onto Summer Time. So hopefully the milder weather slowly -but surely, will bring us proof that the better weather is actually on it’s way. Please do contact me, as I’d love to hear from you and to help ‘spread the word’ on your behalf. ..........Thank You.